Sometimes, we send users to our bots, and using the Hidden Fields functionality, that reads variables in the url, we can populate with values many variables in our bot, without needing to ask the user any more about those questions. However, for some reasons, it could be that one parameter in the url is empty, it could be that is missing in our CRM, so we don't have valuable information and we need to ask it again, just if we don't have such value. ( i.e if no phone number, ask to enter phone number) and maybe send it to our CRM. Here will show how to make the bot spot when the value is missing and how to redirect the user to a flow, where we ask for this information. Here, what we are doing, after a welcome message is to check, whether we collected the @phone value in the url or not. So, if we have a url like this: https://landbot.io/u/H-128508-D3ZDNDFXH0OU4G08/index.html or like this https://landbot.io/u/H-128508-D3ZDNDFXH0OU4G08/index.html?phone=&name=landbot , where the parameter phone is not set, the bot will ask for the phone. 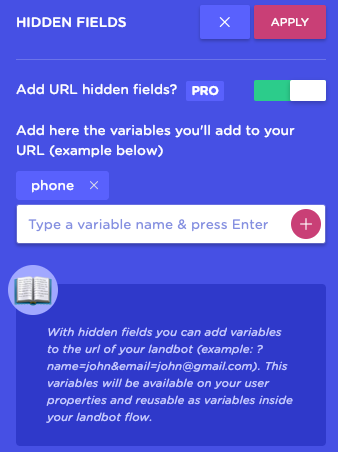 If the link is like this: https://landbot.io/u/H-128508-D3ZDNDFXH0OU4G08/index.html?phone=897398172389712 the bot will capture "897398172389712" as the @phone variable and won't ask the user to add it again. Bear in mind, that during testings if you don't change the browser or clear the storage, once the phone variable is set, it will show up, even if is not in the url.